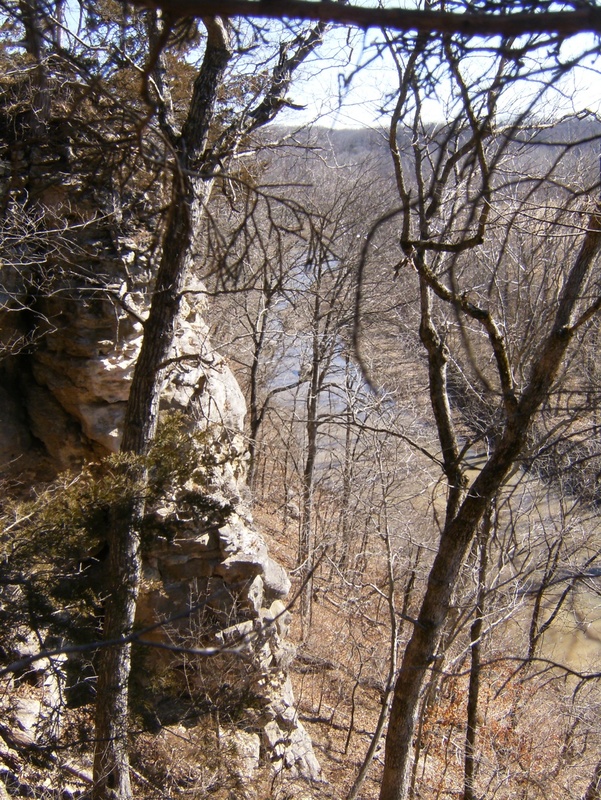 There is a 15000 acre piece of the Mark Twain National Forest southeast of Columbia MO that features the Pine Ridge and Dry Fork Recreation Areas (with decent-looking campgrounds), 22-mile Cedar Creek trail, 5-mile Smith Creek loop, and about 5 miles of other trails, all connected, with access from at least a dozen parking areas. Places where I can go backpacking within 3 hours of home are very rare so I’ve been pretty interested in checking this place out. The Smith Creek loop was said to be particularly nice and seemed to be one of the larger unbroken expanses of trees on a satellite view so that seemed like a good place to start. I headed west along the southern part of the loop where the trail follows an old road with an occasional meander into the woods and back. At the southwest corner of the loop is a junction with the Cedar Creek Trail, on which I proceeded west and crossed Cedar Creek (which does not look suitable for drinking). The Cedar Creek crossing a bit east of Devil’s backbone. I continued west and made my way out onto Devil’s Backbone – a tall and narrow ridge carved on both sides by eons of erosion. It’s not as dramatic as The Pinnacles further north but was a nice enough place for lunch. From there, this particular loop heads north along Devil’s Backbone Road and then east on Englewood Road – gravel roads lined by pastures and passing several farms – before descending back to Cedar Creek and crossing it on the Rutherford Bridge. 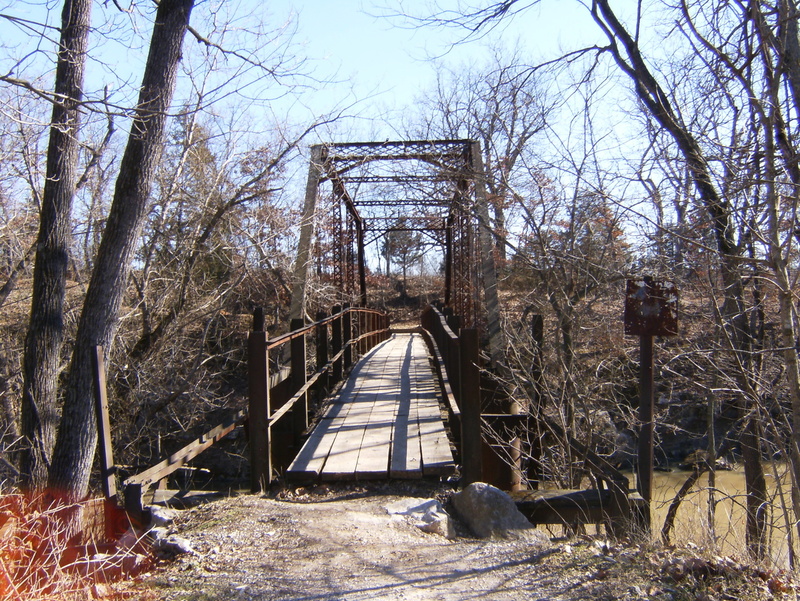 This steel bridge is more than 100 years old, was abandoned for motor vehicle traffic in the 70’s, and converted to a foot bridge in the 80’s. Not far east of the bridge is a junction with the northwest corner of Smith Creek loop. Rather than heading east around the northern part of the loop I headed south on a high bluff with some great views above Cedar Creek to the junction I was at earlier at the southwest corner of the loop. From here I back-tracked east to the parking area. I enjoyed all of the hike except the part on gravel road – I’ll avoid that next time. One big downside of this area is that it’s pockmarked by a plethora of private property so bushwhacking could be tough and the sounds of civilization can intrude unexpectedly. I got a map at the Pine Ridge campground that shows the boundary lines but it’s one of those 3rd or 4th generation copies that has become almost illegible and it doesn’t have the trails marked so you have to reference everything against various county roads. I’ll be returning to explore the trail between the Pine Ridge campground and Smith Creek loop. 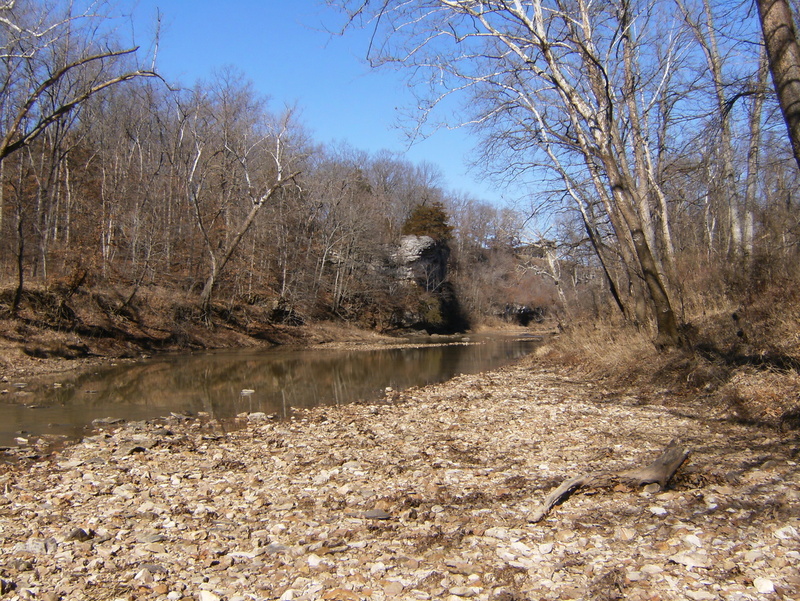 Northwest of this area, and just south of Rock Bridge State Park is Three Creeks Conservation Area, another place I’ve been wanting to explore. I stopped by on the way home but only had about an hour of daylight by that point. I saw enough to convince me to return for a full day of wandering. 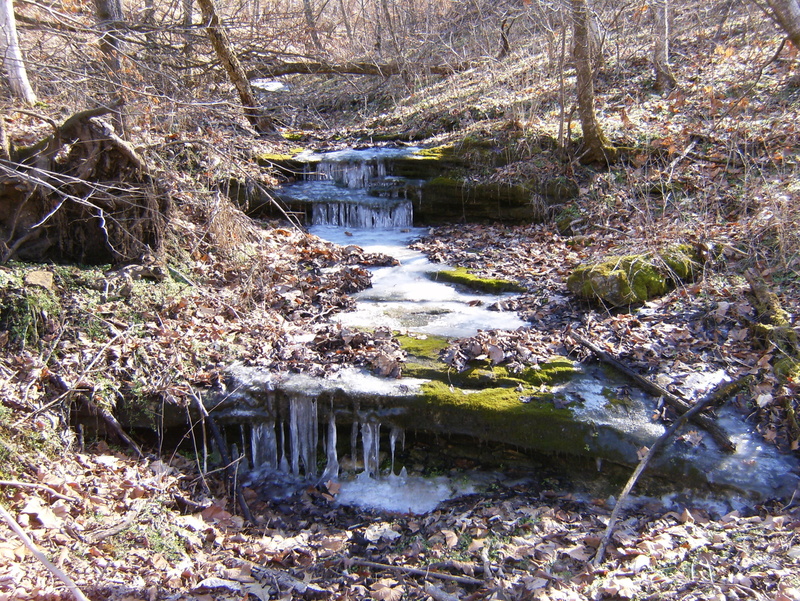 The karst topography has been dissected by three creeks so there is a lot of steep and scenic terrain and interesting rocks. I checked out Pine Ridge Campground and the surrounding area on Google Earth – the trail looks almost non-existent to the south, and pretty hard to follow going north. On the Smith Creek Loop I couldn’t even find the two eastern parking lots shown on the online brochure. Doesn’t look like a good backpacking destination, too much private land around – what were your thoughts? Some of the views look to be worth the effort though. There are large stretches of the trail that are on gravel roads – especially on the south and west sides – seriously reducing their appeal. I think the trail from the Pine Ridge campground to the junction with Smith Creek Loop is all in the woods though it crosses the road twice. I’ll know for sure in a couple weeks. I don’t have a GPS device but as best I can tell the north and south Smith Creek Loop trail heads are at 38.814434, -92.111376 and 38.81104, -92.113244 respectively. For people in the KC area I think it could be a good one-night trip. Those more interested in camping than hiking could make a longer trip of it (provided they know where to get water). 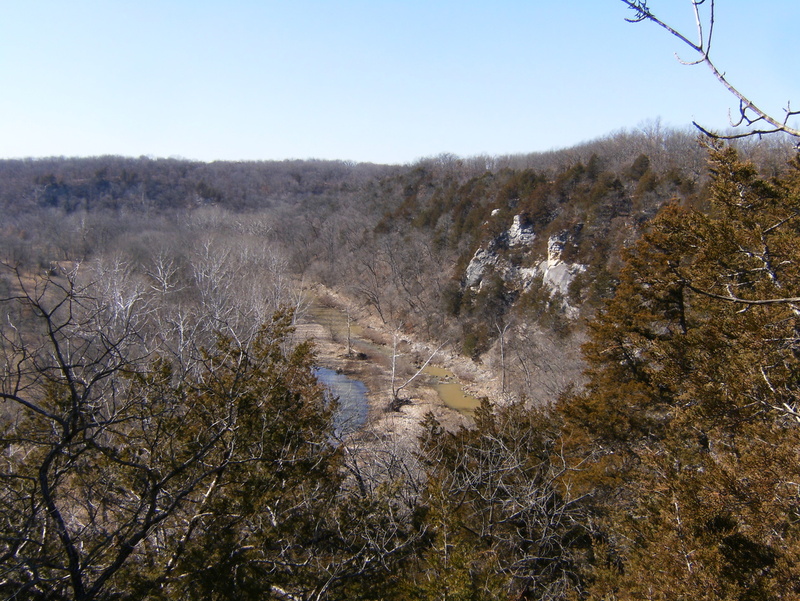 For you, it might be worth a visit once so you can say you’ve been there, but it’s no substitute for the MO or AR wilderness areas.